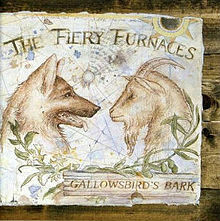 The Fiery Furnaces – Gallowsbird’s Bark – But Is It Any Good? OTHER SONGS YOU MAY KNOW: This music only gets on The Current (MN) or KEXP (Seattle) or other such stations. WHAT’S IT ALL ABOUT: Brother sister duo (with a hired drummer) construct an album of odd, off-kilter songs that borrow from post-punk, grunge, electronica, and Lord knows what else. It works! SOME WORDS, PHRASES AND CLAUSES ABOUT THIS RECORD: The Fiery Furnaces are at times too obtuse even for their fans. In this first album, though, they are pretty straight forward in their skewed musical universe. Eleanor’s vocals and interesting (yeah, that’s the word) lyrics fit right over Matthew’s inventive, challenging and unique arrangements. A song like “Don’t Dance Her Down” has elements of funk, electro-pop and soul all blended together with a disjointed guitar. “Two Fat Feet” was the song that turned me onto the Fiery Furnaces as anything more than just a weird novelty. The guitar in that song is strong, and the rhythm section chugs along (ok, Matthew mostly chugging along with himself). Then, there’s this piano that sounds like a nursery school piano! GRADE: A-: I love challenging music that’s also memorable. This fits that description.